Lately, it seems like Google has just been rolling updates off of the press. These updates come as no surprise following the release of Google Wave and a significant amount of feedback coming from the small number of users who were invited to test it. Earlier today Google released a small update that probably was overlooked by many but turns out very useful. 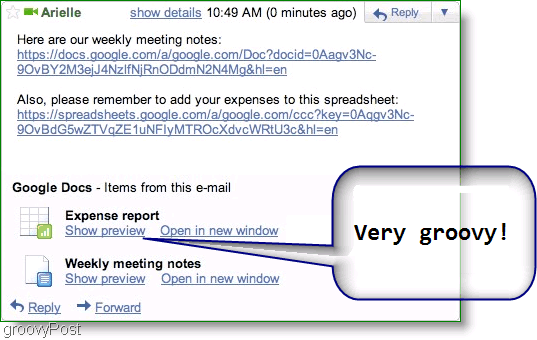 Google Docs now has preview integration of nearly any document sent to Gmail. Personally, I have just started using Google Docs, primarily for their web-based PDF reader. It made me very excited to see that now I could preview PDFs sent to my e-mail without having to open them up in Adobe or Foxit. Is there anything not to like about this update? After looking at the process, I’ve noticed that there is a catch. At first glance, I had thought that this preview would apply to all attachments, which of course would be a dream come true. But after enabling the feature and sending a few test emails, it became apparent that something was wrong. Then I read the fine print again: “shows previews… when you receive a link to a Google Doc.” To preview a document, share it to your e-mail using the Google Documents interface. This preview can be done from the Google Docs application using the Share menu. As a result, if you want to send your documents to your contacts and allow them to preview them, first upload your documents to Google Docs. But wait – your contact will need to have enabled the Google Docs preview feature in labs, since by default this feature is turned off. So go into your Gmail Settings, then Click the Labs tab and down on the list Click Enable next to Google Docs previews in mail. When finished, don’t forget to Click Save Changes! Once you’ve gotten into the “groove” of using Google Docs to send your files, this turns into a great feature! As seen below you no longer need to worry about opening attachments. Instead, now you can just preview a document or even go straight to Google Docs and begin reading, editing, or sharing it with even more people. Can’t seem to get it to work? Think that this is just too darn groovy to stay still? Post a comment below, or Join Us in our Free Technical Support community.